Check-in is between 4pm & 5pm on Sunday. Dinner is served to Campers at 6pm. 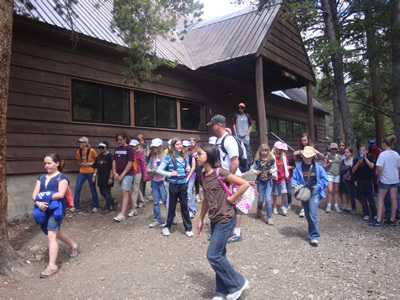 PARENTS: After your child has checked in, you are invited to take a self-guided tour of the Camp Sawtooth grounds. Check-out is on the last day of camp at noon. For 3rd & 4th Grade camp the last day is Wednesday, for all other camps Friday is the last Day. Every day at Camp Sawtooth is filled with activities specially designed for each camp by our creative Summer Staff. Each day is filled with variety starting with a great breakfast and good food throughout the day. OTS (Opportunity To Serve: clean up duties), Chapel, Games, Free time, Activity of the Day (listed below), Small groups, Crafts, Lodge Time, and Campfire. Which Camp Do I Attend? Campers should attend the camp of the grade they will be going into the upcoming fall. Can I be a Camper One More Time? We also welcome graduating Seniors to attend the 11th & 12th camp one last time as a camper before they go on to college or trade school. The 3rd & 4th Camps The 3rd & 4th grade camp will make a trip for an afternoon of swimming. They enjoy fun and games each day along with morning chapel and evening campfire. The 5th & 6th Camps will make a trip for a day of swimming. In addition a road trip to Red Fish Lake for a picnic, swimming and a day fun & games will be a highlight of this camp so bring your water toys. The 7th & 8th Camps will make a trip into Ketchum for a fun day of Ice Skating. So if you have your own skates bring them to camp. If you're a novice you'll have fun laughing and holding onto your friends as you make your way around the shaded outdoor rink. The 9th & 10th Camp will take a trip into Sun Valley to golf the 18 hole putting green and stop for ice cream on the way back to camp. The 11th & 12th Camp will enjoy a full day of rafting. We'll head to Stanley where theThe River Company will take us on a rafting trip down the Salmon River. There is never a dull moment at Camp Sawtooth. Campers will live, worship, play and pray together as part of a Christian community all in the surrounding of God's awesome creation. Friendships and memories are made that will last a lifetime.